Like their home series, Sri Lanka has by and large been outgunned by India, barring their one brilliant bowling performance in Dharamsala ODI, which left the Indian batsmen widely exposed in seaming conditions. Sri Lanka had their best chance in the last ODI at Vizag but collapsed after Yuzvendra Chahal and Kuldeep Yadav ran through the top and middle batting order as they claimed three wickets each. However, T20 is a different ball game and India would look for a smooth transition to the shortest format, having endured a batting disaster in the first one-dayer. 22:25 IST: Thank you for joining us for the live blog. Do tune back in for the second T20I on December 22 from Indore. 22:18 IST: OUT!! Hardik Pandya gets his third wicket of the night, Pradeep slices a ball straight to point. Sri Lanka 87 all-out as India beat them by 93 runs, biggest T20 win. 22:15 IST: OUT! Hardik Pandya gets his second of the night. Chameera looking to go big, miscues and Rahul takes a comfortable catch. 22:11 IST: Four! Full delivery from Bumrah and Chameera slices it through point. Back-to-back boundaries. 22:10 IST: Four! Length ball from Bumrah and Chameera slaps it straight down the ground. 22:05 IST: Sri Lanka 76/8 after 14 overs, need 105 runs in 36 balls. 22:04 IST: OUT! Brilliantly taken in the follow through. Dananjaya’s backed away and flat-batted the ball straight to Hardik Pandya, who takes it comfortably. Great reflex from the all-rounder. 21:59 IST: OUT! Kuldeep Yadav gets his second wicket of the night, dismisses Kusal Perera. Sri Lanka, it seems, have given up. 21:56 IST: Yuzvendra Chahal, take a bow, finishes the match with figures of 4/23. Completely turned the game in India’s favour. 21:53 IST: Stumped! Thisara Perera, who wanted to score some runs for his team, comes down the track, misses and Dhoni takes off the bails in a flash. Sri Lanka are six down, is there any way they can bounce back from this? 21:48 IST: Out! Dasun Shanaka, goes for the big hit, fails to read the wrong one from Kuldeep and Hardik Pandya takes the catch. Sri Lanka are losing their track. 21:45 IST: Sri Lanka 57/4 after 10 overs. 21:42 IST: OUT! Oh boy! This is some clever bowling from Chahal. The spinner makes Asela Gunaratne reach for the ball as he does him round the leg and MS Dhoni fumbles but takes off the bails. 21:39 IST: The boundaries have dried up for the Lankan Lions. India bowlers are on top at the moment. 21:33 IST: OUT!! Looking to punch the ball down the ground, the ball stops and then comes to the bat, Mathews'(1) is caught by surprise as Chahal takes a good catch at the bowler’s ends. 21:30 IST: Brilliant bowling from the Chinaman, concedes five runs. Sri Lanka 45/2 in 7 overs. 21:25 IST: Kuldeep Yadav introduced in the bowling attack. 21:24 IST: Brilliant first over from Jasprit Bumrah, gives only one run. 21:20 IST: OUT! Right then, Chahal gets his revenge and his first wicket. Strays on the leg-side, Tharanga (23) looking to pull, manages to glove it back to Dhoni, who has a very safe pair of hands. 21:18 IST: Six! Couple of steps down the pitch and slams Chahal for a maximum straight down the ground. 21:16 IST: Four! Tharanga shuffles across, down on one knee, sweeps Chahal over the short fine leg. Brilliant batting. 21:14 IST: Superb bowling from Unadkat, gives only two runs off his second over. He has been on-point till now. 21:10 IST: Dropped! Slower delivery from Unadkat, Tharanga fails to read it and the ball clips his gloves and falls inches short of the wicket-keeper. Very very close chance! 21:08 IST: Sri Lanka 27/1 after three overs. 21:06 IST: Four! Tharanga reads the length ball and clobbers Hardik Pandya for a huge maximum over deep mid-wicket. 21:00 IST: Kusal Perera is the new man in. 20:59 IST: OUT! Jaydev Unadkat gets his maiden T20 wicket in form of Niroshan Dickwella. Slower delivery form Unadkat, Dickwella goes early in the shot and the ball straight away goes up as extra cover takes a comfortable catch. 20:56 IST: Four! On the pads from Jaydev Unadkat and Tharanga flicks it beautifully over square leg for a boundary. 20:51 IST: Hardik Pandya opening the bowling for India while Niroshan Dickwella and Upul Tharanga are opening the batting for Sri Lanka. 20:50 IST: Welcome back to the second innings of the game. 20:38 IST: SIX! Dhoni finishes off with a huge maximum on the leg side. 20:37 IST: Terrific bowling from Perera, gives just five runs in four balls. 20:35 IST: Thisara Perera bowling the last over. 20:33 IST: Four! Manish Pandey clobbers a Pradeep full toss through the covers for another boundary. 21 runs off the over for India. 20:32 IST: SIX! Manish Pandey is on a roll, hits another maximum off Pradeep. 20:31 IST: Four! Full toss from Pradeep and Dhoni dispatches it for a boundary on the leg-side. 20:26 IST: India 147/3 in 18th over. How many more can India get in the last two overs? 20:24 IST: Four! Slower delivery down the leg and Dhoni rolls his wrist over the ball past the short fine leg. Cheeky from the former captain. 20:21 IST: 19 runs off the Chaamera over. Big over for India. 20:19 IST: Four! Full from Chameera and Pandey makes room for himself and lifts the ball over covers for a boundary. The bowler is under pressure. 20:18 IST: SIX! Manish Pandey is getting into the act now and the crowd is loving it! Right in Manish Pandey’s arc and he swings it with full force for a huge maximum. 20:16 IST: Four! Short delivery from Chameera and Dhoni takes a couple of step down the ground and pulls it over the mid-wicket area for a boundary. 20:14 IST: Four more overs to go. India 119/3 after the 16th over. Dhoni and Manish Pandey are out in the middle. 20:12 IST: Sri Lankan bowlers have brought their team back in the game with some disciplined bowling and crucial wickets. India, who were looking to go past 180 with ease, are now looking a bit reserved. 20:08 IST: OUT! Beautiful slower delivery from captain Thisara Perera. KL Rahul looking to go big, heaves and misses as the ball crashes in the stumps. India 112/3 in 14.3 overs. 20:05 IST: India 110/2 in 14 overs. Dhoni and Rahul are out in the middle. 20:03 IST: Four! Couple of steps down the ground and Dhoni dispatches Dhananjaya straight down the ground with great power. 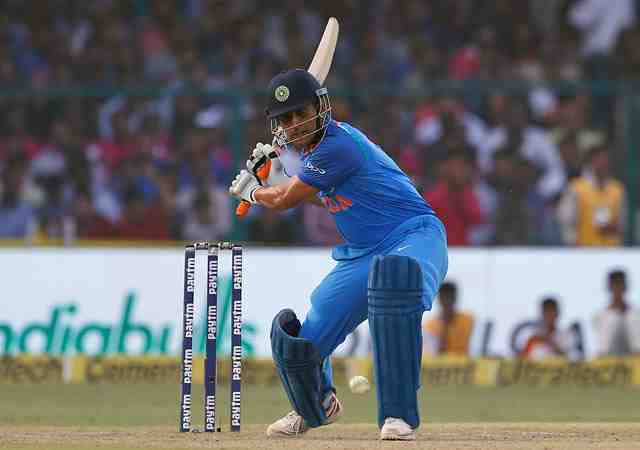 19:59 IST: MS Dhoni comes in at number four for India. 19:57 IST: OUT! Nuwan Pradeep bowls a shorter delivery to Shreyas Iyer, closer to his body. Iyer looking to make room and dispatch it over cover, edges it back to the wicket-keeper. India 101/2 in 12.4 overs. 19:53 IST: Four! Shreyas Iyer wait and waits and then opens the face of the bat as the ball runs down to the boundary past the wicket-keeper for a cheeky boundary. Brilliant from the young man. Dhananjaya is not happy. 19:50 IST: 50-run Partnership comes up between KL Rahul and Shreyas Iyer. 19:48 IST: Rahul takes a soft single off Pradeep and notches up his second T20I half-century. India 84/1 in 10 overs. 19:46 IST: Four! Pradeep starys on the pads and Rahul pounches on it for yet another boundary. The Indian opener looks like he is in his elements. 19:44 IST: Nuwan Pradeep, right-arm fast medium, comes into the attack. 19:42 IST: SIX! Short ball onto the hips and Rahul flat-bats the pull over deep backward square leg for the first maximum of the match. 19:37 IST: Four! Back-to-back boundaries for Rahul off Perera. It looks like Rahul is confident and is changing gears. 19:36 IST: Four! Short from Perera and Rahul pulls it handsomely for a boundary through the deep mid-wicket region. 19:35 IST: Thisara Perera comes into the bowling attack. 19:34 IST: India 53/1 in seven overs. 19:31 IST: Safe!! Angelo Mathews appeals for an LBW. The on-field umpire raises the finger but KL Rahul is not convinced and takes a review. The ball was missing leg and was going over as well. Rahul stays put. 19:28 IST: Four and four! Shreyas Iyer has been in sublime form in the series. Pummels Chameera for two back-to-back boundaries. First through the off-side and then through the leg-side. 50-up for India in the sixth over. 19:28 IST: Four and four! Shreyas Iyer has been in sublime form in the series. Pummels Chameera for two back-to-back boundaries. First through the off-side and then through the leg-side. 19:23 IST: OUT! Brilliant delivery from Mathews. Rohit trying to go over mid-on, miscues the ball and the man at mid-on ran and dived forward to take a great catch. No power in the shot. Rohit’s wife watches in disbelief as he takes the long walk back to the pavilion. 19:21 IST: Four! Mathews strays on the pads and KL Rahul dispatches it for a boundary. Easy picking for the right-hander. 19:18 IST: Angelo Mathews comes into the bowling attack. 19:16 IST: Four! Rohit Sharma rocks back and punches Dhananjaya off the back foot for a boundary through the off-side. 1500 runs for the opener in T20 career. 19:15 IST: Four! KL Rahul welcomes back Dhananjaya with a boundary on the leg-side. Full-toss on the pads, Rahul, down on one knee, places the ball behind square. 19:14 IST: India 20/0 after three overs. 19:12 IST: Four! Full from Chameera and KL Rahul lifts the ball up and over the inner circle to collect his first boundary. Kusal Perera’s chase is wasted as the ball rolled away to the boundary. 19:10 IST: Dushmantha Chameera has been introduced into the bowling attack. Captain Perera is keeping his bowling fresh at the moment. 19:09 IST: Good first over from the Lankan spinner. He has kept thing tight and the Indian batsmen are being careful. The spinner gives only three runs off his first over. 19:07 IST: Akila Dhananjaya, right-arm off break, comes into the attack. 19:06 IST: India 10/0 after the first over. 19:04 IST: Fernando bowls on the pads and Rohit flicks it towards deep mid-wicket for three runs. 19:02 IST: Four! Full from Fernando and Rohit guides it through covers for the first boundary of the match. Beautiful from the Indian captain. 19:00 IST: Rohit Sharma and KL Rahul are opening the batting for India while debutant Vishwa Fernando is opening the bowling for Sri Lanka. 18:55 IST: Both teams are on-field for their respective national anthem. 18:35 IST: Team changes: KL Rahul and Jaydev Unadkat come in for Shikhar Dhawan, who has been rested and Bhuvneshwar Kumar, who is not part of the squad. 18:30 IST: Sri Lanka captain Thisara Perera wins toss, elects to bowl vs India. 18:25 IST: Vishwa Fernando set to make his T20 debut for Sri Lanka. 18:20 IST: Last time India hosted Sri Lanka for a T20 series in 2016, the hosts won it 2-1. 18:15 IST: India has won their last four T20s against Sri Lanka. On the other hand, Sri Lanka has lost their last five T20s. 18:00 IST: Team India on their way to the stadium. 18:00 IST: Hello and welcome to the live blog of the first T20I match between India and Sri Lanka straight from Barabati Stadium, Cuttack. India does not have a happy memory of the solitary T20I at the Barabati Stadium. The Men in Blue had folded for 92 against South Africa in 2015 as crowd trouble brought infamy to the venue. India lead Sri Lanka 7-4 on the head-to-head count and are yet to lose against them in the last four outings, the hosts will aim to give a better account of their batting. India’s batting will heavily rely on skipper Rohit, who will have KL Rahul for the company at the top.